Both the International law and US constitution prohibit killing outside of armed conflict without due process, “except as a resort to avert a concerete, specific, imminent threat of death or serious physical injury”, yet the United States continues the use of drone strikes in “targeted killings” of “suspected” terrorist overseas that “might” be plotting against it without due process of law. This has caused the unaccounted deaths of hundreds in Yemen, Somalia and Pakistan and widespread anger. The first known US drone strike approved by Obama in Yemen was in Ma’jalah, Abyan, on 17 December 2009, killing 41 local residents, including 14 women and 21 children, and 14 militants ــ alleged Al Qaeda members ــ only one of which was confirmed to be connected to Al Qaeda. A Yemeni investigative journalist remainsin prison until today for “un-covering” this story. A policy shift, approved in April 2012, allowed the C.I.A. and the military’s Joint Special Operations Command to strike militants in Yemen who may be plotting attacks against the United States, without necessarily knowing their identities. Thus, both the the CIA and Pentagon have been carrying drone strikes in Yemen and have separate kill lists of unconfirmed “suspects”. According to the Bureau of Investigative Journalism 116 drone strikes have been carried out in in Yemen since May 2011, of those attacks only 39 were confirmed by officials to be carried out by the United States. Hence, hundreds of deaths by drone strikes are unaddressed, unacknowledged and unaccounted for and many of those killed were not confirmed to be actual militants. This year alone there have been more than 200 deaths from the strikes in Yemen. Last week a misdirected U.S drone strike killed 13 civilians, including 3 women (one of them reportedly a 10 year old girl) causing widespread anger among Yemenis as have many other strikes before. Yemenis have protested against the strikes and so have activists on twitter who launched a #NoDrones campaign in May 2012 to express their anger towards the strikes and to demand the U.S administration to halt them. 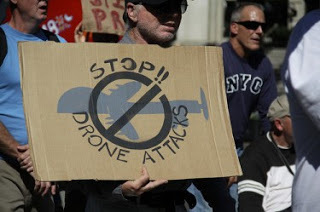 They have renewed their campaign against U.S drone strikes using the same hashtag #NoDrones. Yemenis hold both the U.S administration and Yemeni government accountable for the loss of the civilian lives, a.k.a “collateral damage” and the killings of “suspected” militants without any proof or fair trials. Both are partners in these unlawful attacks, the former for justifying and executing the strikes and the latter for allowing them to do so. Change the primary face of the U.S government in Yemen to alter the perception that U.S interest and attention are solely dominated by counterterrorism and security issues. Reevaluate the strategy of drone strikes with the recognition that it is generating significant anti-American sentiment. Work with Friends of Yemen to provide humanitarian aid for the more than 10 million Yemenis going hungry daily. Support the restructuring of Yemeni security towards a unified command hierarchy under Yemeni civilian leadership. And this is what Yemenis had to say: – “Dear Obama, when a U.S. drone missile kills a child in Yemen, the father will go to war with you, guaranteed. Nothing to do with Al Qaeda,” a Yemeni lawyer warned on Twitter. – “I will join even Satan if I have to in order to get revenge for my wounded 7 year old son,” said one angered father from Jaar who preferred to remainanonymous. – “Indeed, the drone program is leading to the Talibanization of vast tribal areas and the radicalization of people who could otherwise be America’s allies in the fight against terrorism in Yemen,” said Ibrahim Mothana, a democracy activist. – “There is more hostility against America because the attacks have not stopped al-Qaeda, but rather they have expanded, and the tribes feel this is a violation of the country’s sovereignty,” said Anssaf Ali Mayo, Aden head of Yemen’s al-Islah Islamist party. – “This is seen from the fact that US strikes are seen as an invasion, an occupation and a breach of sovereignty,” said a citizen journalist. A USAID official boasted about the U.S being the largest provider of humanitarian aid, in the last Yemen donor conference held in Riyadh. Yet, what Yemen needs most besides aid is for the drone strikes to end. There is nothing human in the use of drone strikes to “fight terrorism” in Yemen. U.S drone strikes continue to destabilize the country further, instill fear in the civilans who can be possible targets, breeds resentment towards the U.S, and increases militants in Yemen and thus terror. In fact al- Qaeda has been growing in numbers since the U.S strikes intensified in Yemen, they were estimated to be 300 members in 2009 and despite the ongoing drone strikes and constant reported killings of al- Qaeda militants and “suspected’ militants, they are now reported to be more than 700, i.e more than double the initial figure. This clearly indicates, as many experts have stressed, that the U.S counter terrorism policy in Yemen needs to be seriously examined and consequently re-evaluated. disregarded. The massive peaceful protests that took to the streets of Yemen, demanding freedom and democracy were often faced with brutal security forces, yet hardly reported in the news. Many Yemeni activists assumed the role of citizen journalists, documenting, translating and reporting what was happening in the country via social media networks such, Facebook, Twitter, Youtube and blogs. Through their interaction, a group of activists, bloggers, journalsist, videographers, photographers and web designers formed a campaign group called SupportYemen using short video clips highlighting the peaceful movement and addressing topics affecting the majority of Yemenis, including the humanitarian and economic situations. The group is made of independent activists in Yemen and in the diaspora who joined their hearts and minds to work together to advocate for the change they want to see in Yemen. The First video released by SupportYemen on October 9, 2011 was called “Break The Silence”. It was aimed at the International community, emphasizing the group’s’ resistance to the attacks of the government forces and their determination to continue demanding what they originally set out to achieve – equal rights, liberty, freedom from oppression and a dignified life. The fourth video by SupportYemen called “I Will Fight For My Rights” was a powerful message to the Yemeni community advocating for women’s rights. It is important to point that SupportYemen is an independent group that does not receive any funding from any country or organization and all the work produced has been financed by the group members themselves. I am proud to be part of this great group and hope that together with our advocacy work, and with the other NGO’s, independent groups and activists we will hopefully bring about the change we all seek in Yemen. YEMEN: THE POIGNANT DRONE TWEETS OF SARA JAMAL | The Approximate Target Blog on Why US Drone Attacks Should Stop in Yemen and Elsewhere!